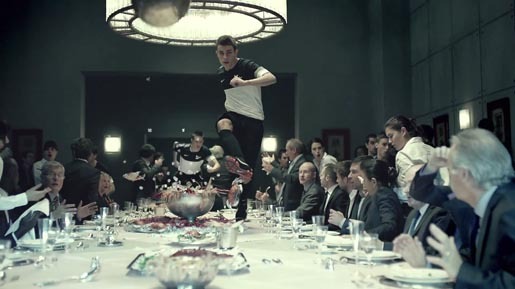 Nike has launched “My Time Is Now”, an advertising campaign for the 2012 European championship, promoting a new generation of football players and the Clash Collection boot collection. A three-minute film opens on a soccer match between France and Holland. The field is taken over by young players from “The Chance,” Nike’s scouting mission to find 100 potential soccer champions from 50 countries. The commercial includes cameo appearances by Neymar, Franck Ribery, Wesley Sneijder, Mesut Ozil and Danny Welbeck, and even LeBron James. The Youtube version of the film invites viewers to go through hidden tunnels to get a deeper look at athletes and their inspirations. The My Time Is Now campaign was developed at Wieden+Kennedy by creative team Ben Everitt, Al Merry, Scott Dungate, creative director Stu Harkness, agency producer James Guy and account director Ryan Fisher. Filming was shot in London, Barcelona and Madrid by director Adam Berg via Stink with producer Ben Croker and director of photography Joost Van Gelder. Editors were Paul Hardcastle and Gus Herdman at Trim. Post production was done at The Mill. Sound was produced at Factory by sound engineers Anthony Moore and Tom Joyce. Music is “Chicken” by The Eighties Matchbox B Line Disaster, courtesy of BMG Chrysillis. Interactive elements were produced at AKQA and Stinkdigital.